My nephew, Blayke, a multi-talented young man who loves to draw, expressed interest in drawing something for me. 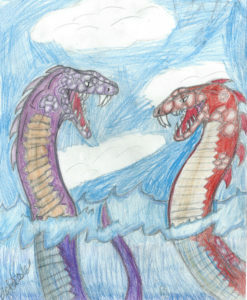 I told him I’d like to see if he could draw an oskorlisk, namely one of the giant serpents which plague the Sea of Koralis. He did a great job, didn’t he? I was also shocked to discover he has his own YouTube channel! And finally, we have the cover for Amulet of Aria (Bakkian Chronicles #3)! I mentioned earlier that Brett provided some illustrations that I used in Lost City. Here are the Narian Power Hammer and the QM! Brett asked if I needed any illustrations for SWtwC and I told him an illustration of a dragon egg would be cool. Here’s what he came up with! Awesome, isn’t it? Everyone loves maps, right? Here are two maps I created of both Lentari & Ylani! 3D guur illustrations! Thanks Raphyel! The Mythra Triad, drawn by the multi-talented Brett Gable! Kathy Skipper on Paperback Giveaway! Fire Thrower on Paperback Giveaway! Tricia Pendergrass on Paperback Giveaway! Julie Grainger on Paperback Giveaway! John Alexander Smith on Paperback Giveaway!